Electric golf carts are all equipped with batteries; these batteries are deep cycle based and similar to what you would find on marine boats. A deep cycle battery can last for years if well maintained but will burn out quickly if neglected. It’s important to keep your battery charged, allowing it to lose too much power can actually damage the battery. There are lots of charger options, both standard electrical and solar chargers exist, for best results it’s a good idea to have a charger that will automatically switch to low charge when the battery is full. It’s best to charge the battery after every use and especially if you plan to leave it stored for an extended period of time. 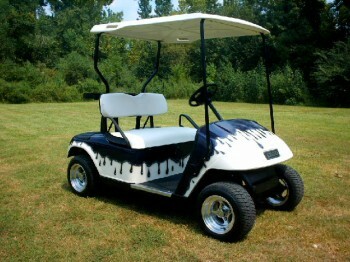 One vital rule you must always remember when handling a golf cart battery is safety, always wear gloves and goggles. The batteries are acid based and use electricity neither of these things are fun for your skin and eyes. Never neglect safety for speed or convenience. It’s also vital to charge the battery correctly. Doing it wrong could damage the battery. Once you’ve removed the battery from your cart use baking soda and water to clean the battery connections and cables. If the caps on your battery come off then fill the cells with distilled water. Dirty water or tap water is not ideal to get the best performance out of your battery. Therefore, use clean water. Connect the cable to the battery and follow the instructions that came with your charger to make sure all connections and settings are correct before powering it on. Charge time can vary depending on the battery and the charger but it’s a good idea to try and detach the charger as soon as the battery is fully charged. Immediately re-install the battery in the cart unless you plan to store it. If you don’t plan to use it again you can leave it plugged on a low charge setting. If you don’t leave it plugged you will need to recharge it in about two weeks before you use it. The battery will not hold its charge longer than a few weeks at most. As mentioned earlier it’s not a good idea to let your batteries completely lose their charge. A process called sulfation causes sulfur to build up on the lead plates and eventually your batteries will no longer work. If the worst happens however there are a few steps you can take to salvage the situation. Battery reconditioning will only work for so long, if you continue to allow your battery drain too regularly it will eventually stop working. The process is fairly simply drain all fluid from your battery and replace it with 85% distilled water and 15% Epsom salt. Again it’s very important to use clean water tap or dirty water will not be as good for a battery that is already suffering. Recharge the battery and test it, it will probably not charge completely the first time after reconditioning, that is normal, simply charge it again. Once again the most important rule of battery maintenance is safety first, always use protective gloves and goggles while working with the batteries it uses electricity and acid after all and they are not your friends.